In feng shui practice, pairing the symbols of the dragon and the phoenix together is a common means of keeping (and attracting) the energy of harmonious communication. Though by no means the only ways of promoting good marriage, the dragon and phoenix together are a classic prescription, owing in large measure to the power of each individual symbol for creating good feng shui in your home. The energy of the dragon is considered very powerful in traditional feng shui. Almost all classical feng shui applications (especially office and business feng shui) involve decorating with the dragon symbol in one way or another. The dragon is the most powerful and majestic creature in Chinese folklore, thus much revered by the followers of classical, or traditional feng shui schools. Power, indisputable authority, and fearsome majesty are mostly masculine (yang) qualities, and the dragon represents the true Yang part of the Yin-Yang energy of the dragon and phoenix couple. 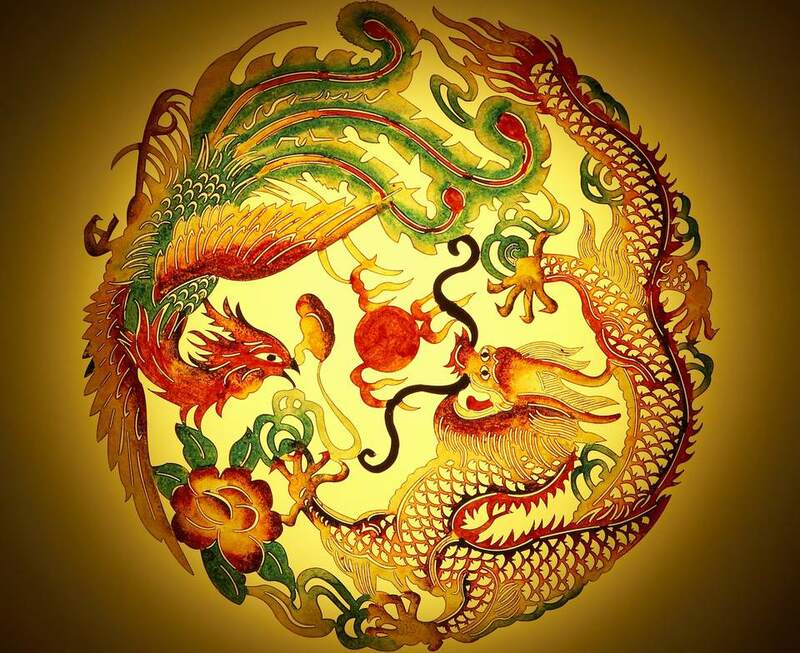 Note: the dragon energy associations are not the same in other cultures, so be mindful of your own conscious (or unconscious) impressions about the dragon energy in order to decide if this is the best feng shui cure for you and your home. Unlike the dragon, which has many different connotations across various cultures, the symbol of the phoenix seems to evoke the same energy and meaning across all cultures—it stands for the power of rebirth and deep transformation. The phoenix is the queen of all bird symbols in feng shui, and it is the one most revered. In Chinese folklore, the mythical phoenix is attributed with the qualities of beauty, inspiration, and genuine grace (feminine yin qualities). This makes the phoenix the perfect Yyin counterpart to the Yyang energy of the dragon. Because a harmonious marriage is a balanced partnership in which both the husband and the wife can fully express their unique energies, the yin-yang energy of the dragon and phoenix together came to be a feng shui symbol of good luck and harmony in marriage. In most representations, the dragon and the phoenix form a dance or a circle of two energies, forming a shape resembling the classic yin-yang symbol. This pairing of symbols is one of the most powerful motifs in all Chinese imperial designs and it remains a popular element in Chinese clothing, jewelry, and many home decor accessories. As both the dragon and the phoenix are mythical creatures, they can be represented in slightly different ways to match the vision of different artists, and also to create specific associations. For feng shui use, one can choose either a sculpture or a painting/illustration of the pair. The best way to place the dragon and phoenix as a feng shui love cure is in the love & marriage area of your home bagua (this is the southwest area if you follow the classical feng shui school or the upper right area if you follow the BTB feng shui school). You can also choose to display the pair in your lucky direction for love (which is calculated based on your date of birth). The dragon and phoenix couple together is one of the best Chinese feng shui love cures, but you might also consider the Double Happiness sign and the Mandarin Ducks. No matter which feng shui love cure you choose for your home, be sure its energy truly represents your idea of a happy, harmonious marriage. Do not choose a feng shui cure because you were told to—choose it because you truly like it and because it speaks to you.